Mackenzie and Amy were best friends. Until Amy was brutally murdered. Since then, Mac’s life has been turned upside down. She is being haunted by Amy in her dreams, and an extremist group called the Trackers has come to Mac’s hometown of Hemlock to hunt down Amy’s killer: A white werewolf. Lupine syndrome—also known as the werewolf virus—is on the rise across the country. Many of the infected try to hide their symptoms, but bloodlust is not easy to control. Wanting desperately to put an end to her nightmares, Mac decides to investigate Amy’s murder herself. She discovers secrets lurking in the shadows of Hemlock, secrets about Amy’s boyfriend, Jason, her good pal Kyle, and especially her late best friend. Mac is thrown into a maelstrom of violence and betrayal that puts her life at risk. 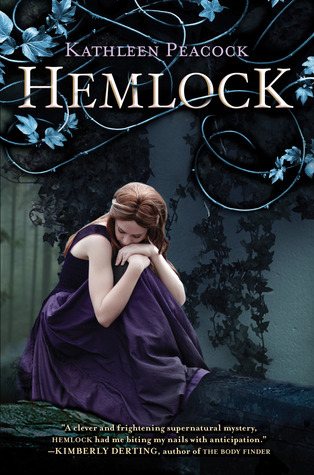 Kathleen Peacock’s thrilling novel is the first in the Hemlock trilogy, a spellbinding urban fantasy series filled with provocative questions about prejudice, trust, lies, and love. The Cover: I am not really feeling this cover. It is a beautiful cover in itself, but it doesn't really align with the story for me. I dislike when covers have girls with fancy dresses on them for the sake of having a girl with a fancy dress to sell books (although admittedly that does work!) It is a beautiful cover however. The Characters: I loved Mac. I dislike that people call her Mac, but I love her as a character. Mac is a strong character who doesn't find her value in the the people around her, especially the boys. She is a conflicted person- struggling with guilt from Amy's death and the hurt of knowing that the people around her aren't incredibly honest with her. I loved Jason and Kyle as male protagonists. I liked how the author diverged from the "Good guy vs. Bad Boy" love triangle. Both Jason and Kyle have secrets that they are keeping from Mac and neither is completely good or bad. The Story: I will admit- I don't like werewolf stories. I didn't like Shiver. I didn't like the werewolves in Twilight or Harry Potter. I am a believer now. This author wrote the werewolf narrative in a smart way. It was as much of a mystery story as it was paranormal. The story flowed well and kept me on my toes. I love how the author handled all of the romantic relationships between the main characters. I also really enjoyed how the author revealed all of the secrets that the characters were hiding. The author didn't tell us what was happening or explaining- the story flowed so well that I struggled putting it down! I honestly had no idea how this book was going to end. I was completely surprised with how much I absolutely loved this book. I can't wait for the next installment! I am so excited about this book. I have a love/dislike/mostly dislike relationship with werewolf books. Shiver didn't do it for me. I really enjoyed Raised by Wolves and Trial by Fire by Jennifer Lynn Barnes. That being said, I like to try and give werewolf stories a chance because I know there is a gem out there somewhere. From everything that I have read about Hemlock, this may just be my gem. As far as covers go, I am with you 100%. A cover should give you a hint to what the story contains when you pick it up, or make you go "Ohhhh, I get it". I want the cover to be one of those things, not just a pretty girl or pretty boy or a pretty dress. They may be gorgeous, but that is what pictures and paintings are for!